Sculptural and solid in marble and wood, the island in this kitchen stands out in contrast to the matt black wall behind it. The polished concrete floor ideally complements both the natural wood and the veined Carrara marble. This clean-lined kitchen, designed by architect Matthew Murfett of Mitsuori Architects forms part of a larger modern renovation to a heritage home. 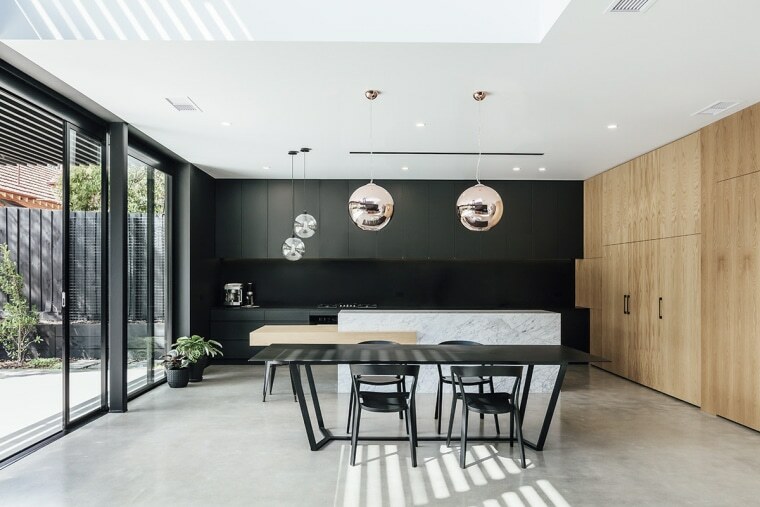 “The owners wanted a comfortable and functional family kitchen to reflect the wider contemporary, minimalist aesthetic and also their preference for black joinery,” says Murfett. Two key zones comprise the new kitchen – the main, open-plan workspace and, alongside, a utility-pantry-laundry room. The latter doubles as a mudroom and informal entry to the home. “The main kitchen area creates a backdrop to the family living space while the pantry and utility area is concealed behind a timber wall and remains largely out of sight,” Murfett says. 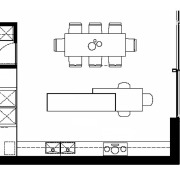 “The refrigerator and freezer are both contained within the side wall that divides the rooms." ”Integrating the appliances behind the wood wall allowed for an uninterrupted six-metre long kitchen perimeter bench at the back of the kitchen proper – another requirement of the brief." The rear benchtop, splashback, cabinetry and wall ovens are all completely black – providing a recessive end wall to the open-plan space. “The benchtop and splashback are in Dekton, used to create the matt black finish and also tie in with the fireplace hearth and an external seating element in the same material,” says Murfett. Standing out in contrast to the matt black wall is the white Carrara marble island – the centrepiece of the kitchen. From the living area this appears as a monolithic sculptural element. The substantial marble benchtop operates as a worksurface, while the lower, cantilevered wooden bench serves as a breakfast counter. The kitchen’s hidden pantry, fully integrated refrigeration and matt black rear wall together downplay the kitchen’s functionality visually.